Discussion in 'Chit Chat' started by gorski, Jul 24, 2016. But this is WORTH KNOWING!!! It is said that war brings all the worst and all the best from people. One of the minor characters in Serbian film 'Pretty Village, Pretty Flame' at this point asks the question: "Jeez, what's the best?" This is the right answer to cynicism by a movie character. This year launched an initiative to one of the streets of Zagreb call in honor of Diana Budisavljević, which is his street recently received and in Belgrade. The general public it is practically unknown, although in some favorable times deserved all social honors. For readers Lupiga name Diana Budisavljević is not so unknown, since we had mentioned in the text of the Culture oblivion - exploring the unknown Zagreb. At this point, we will expand the material. Who was this Zagrepčanka? 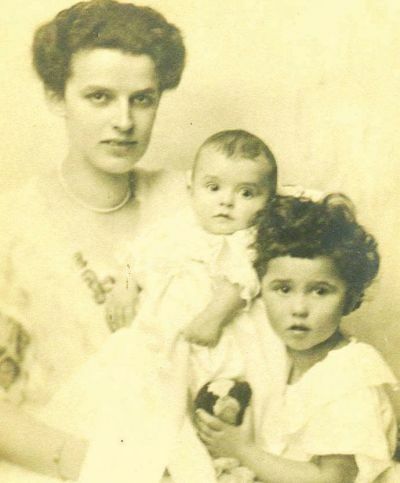 Diana Budisavljević (born Obexer) was born in Innsbruck, Austria in 1891. In Zagreb he moved here in 1919 when she married the Zagreb surgeon and professor, School of Medicine in Julius Budisavljević. In Zagreb he met World War II when it begins its activities as humanitarian workers contributed to the rescue of thousands of children. Taking advantage of his Austrian origin and social standing, has organized what would become known as the "Action Diane Budisavljević" - extensive rescue children from the Ustasha camps. Above all it was a Serbian children from Kozara and Kordun. "During the ride I was not on the train could not move, so I stepped on someone. Bigger children are constantly sitting on a chamber pot, a small have get dirty. The floor was full of mud and children's worms. I tried as much as I could to move the kids to get them pulled from the mud. Before morning, the cells were coming people see misery, adding our water. When longer stopping healthy children are out of the wagon. the sisters exhausted dropping children out of the car and taking them back again. Many coaches have not had a step. the bad in the last two cars, one could not even think that they are removed from the wagon. I managed to get a rake, so I wish I could throw worms. it seemed that before a child dies worms leave the body, because toward the morning, as we let the kids stayed weak, the whole ball of worms leaving the body. " Diana Budisavljević and sister Red Cross list of children prior to transport to Zagreb (camp Stara Gradiska, 10 July 1942) In Zagreb, the first children were placed in various hospitals and institutions, and then taken to the children's reception center in Jastrebarsko, Sisak and Gornja Rijeka, of which it is in Sisak was a real camp for children - the only children's camp in Europe. Only in August 1942, obtained the license to the children from the camp to accommodate the families. Adopting is performed via "Caritas" Zagreb Archdiocese. Many of the rescued children who have lost parents in the war, remained with foster families after the war. The move had a large network of collaborators, some of whom had to pay and life. Many famous people of Zagreb were also involved in the rescue operation. There were a lot of doctors and nurses, and in his diary as closest associates Diana Budisavljević stands Brand Vidakovic, Kamila Brössler, Djuro Vukosavljevic, Ljubica Becić, or wife painter Vladimir Becic and their two daughters, Mira and Vera, and Vera Cerne and Dragica Habazin. And Cardinal Alojzije Stepinac of 1942 helped the action. Diana Budisavljević launched a campaign that is unprecedented. Action during the war, and particularly during 1942, in scope, the number of participants and the number of rescued children grew into one of the most complex and arguably the most humane action of this kind in the entire NDH and occupied Europe. According to transport sheets, hospital files and filling in all the details and description of the children Diana Budisavljević and his associates developed a comprehensive cabinet or base with photos. Data were entered to the war facilitate finding them, but also to preserve their identity. Immediately after the liberation in 1945 at the request of the Department of protection Nations (Department of National Defence) had to hand over the entire cabinet. Subsequently withdrew from public life, and later and returned to his native Innsbruck, where he died in 1978 without ever having received any recognition for her humanitarian work. Children saved by Diana Budisavljević Humanitarian activities Diane Budisavljević during and immediately after World War II contributed to the establishment of social work as a profession in Croatia. Her work is considered the forerunner of all significant aspects of the Convention on the Rights of the Child in the case of children in war. But despite the unquestionable merits, its name is today still not mentioned in any encyclopedia no textbooks in Croatia. Oscar Schindler saved 1,200 Jews and thanks to the film for him the whole world knows. Diana Budisavljević saved 12,000 children and is virtually unknown. In the end we are left with the question, is not this great Zagrepčanka deserved to at least mention the Croatian textbooks? That woman should be immortalized for her selfless deeds. Not only in her own country, but around the world. Damn! I forgot NDH (Nezavisna Drzava Hrvatska), against which Nazi-Fascist political and military background she has done her glorious work!!! Looking at the Hilary/Wasserman-Schulz happening in Philly, is there not right now a more urgent subject that people should be thinking about? 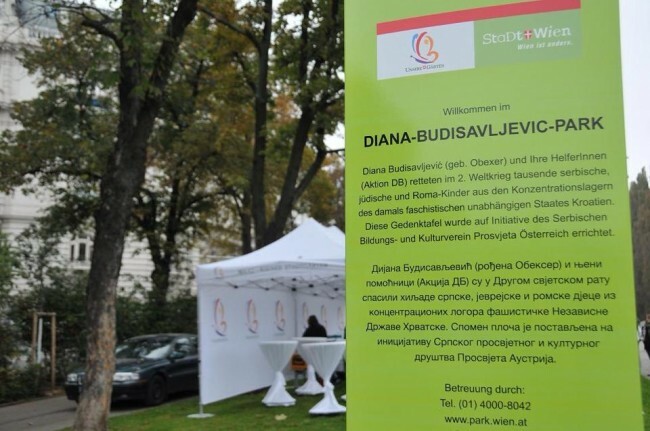 On Monday , 13 October 2014, a park was Vienna opened dedicated Diana Budisavljević that at least 12,000 in World War II children rescued the Ustasha camps. Diana Budisavljević will of the many Serbs with Oskar Schindler compared. The married to a Serbian surgeon Austrian lived in Zagreb, where they rescued from the death camps of the Ustasha during the Second World War about 12,000 children, mainly of Serbian origin. This great woman was now dedicated in Vienna Josefstadt a park. At the opening and unveiling of a plaque on 13 October 2014 commemorating the deeds of Diana Budisavljević were Martina Malyar, District Chairwoman of the ninth district of Vienna, Pero Jankovic, ambassador of Serbia and Vladika Andrei, Bishop of the Serbian Orthodox church Austria-Switzerland -Italy. the project by the Serbian educational and cultural association "Prosvjeta" and in cooperation with the youth organization of the SPÖ was initiated implemented. "The visible signs of remembrance for Diana Budisavljević here in a park showing the great connection between diverse peoples and states. I am very proud that the Serbian community is approached us, or I would never find out about this great woman. She is a shining example that we should live in peace with each other, "said District Chairwoman Malyar. "Such a mark in the public space, is a signal that we are accepted Serbs in Austrian society," said Srđan Mijalkovic the association Prosvjeta in an interview with the magazine KOSMO. "We are an integral part of this city, and we hope to participate in all areas of society," said Mijalkovic.